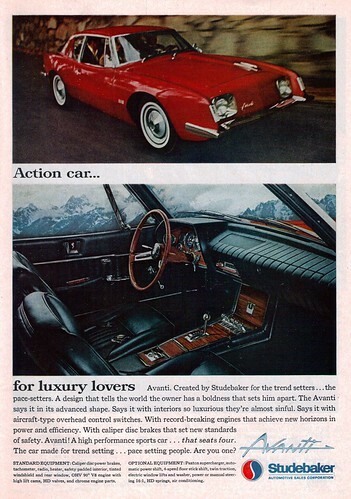 The Studeblogger: Studebaker Ad of the Week, #3: Avanti! 1964 Studebaker Avanti , a photo by coconv on Flickr. Love this ad for the '64 Avanti. As a good friend of mine says, "When this thing hit showrooms, it was like nothing anybody'd ever seen. It was a flying saucer." The wheels keep on a-turnin.